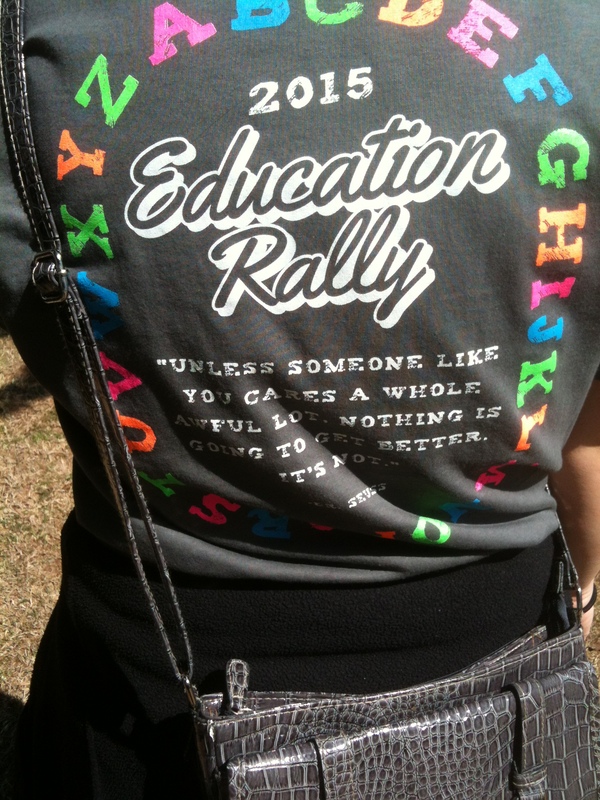 Last year after the rally, I collected pictures of some wonderful signs and shirts. Feel free to send me more today! I’ll post a blog later showing the best ones I receive. For now, I’m starting the day off with a little help from Joe Cocker. Towards the end of last night’s #oklaed chat, Jason James asked a great question that I thought would make a good topic for all education bloggers in Oklahoma. 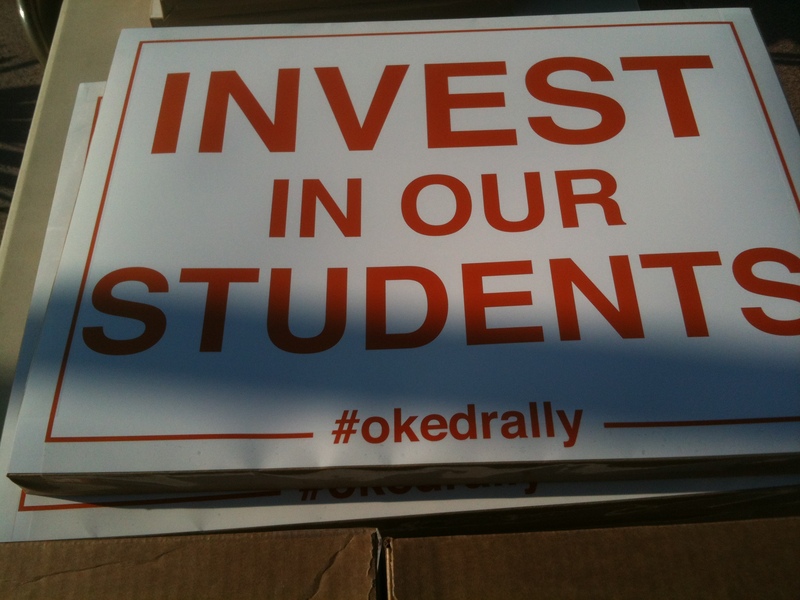 Q9: If you were "King for a day" or "Queen", what would be the first thing you'd do to improve #oklaed? Second thing? Rob Miller even suggested a word limit. Let's do this, but 600 words or less limit! 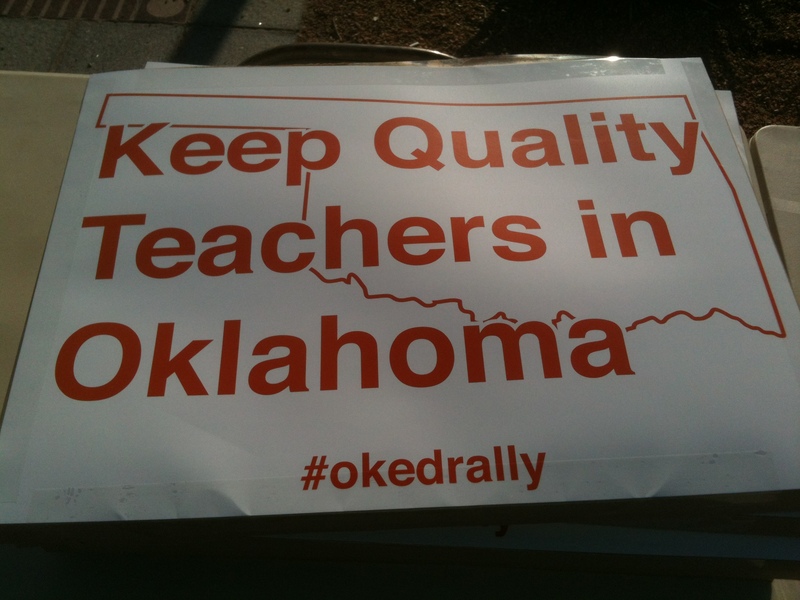 RT @okeducation: Q9 should have been a writing prompt for all #oklaed bloggers! First thing I’d do? Second thing? 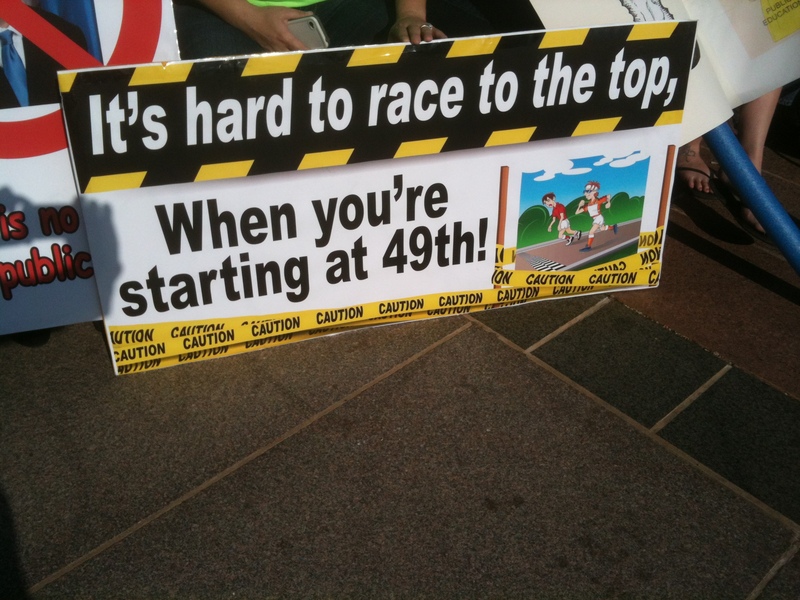 That’s tough, because there are about 25 things I want to do. And limit myself to 600 words? Even tougher! I’ll start with my Twitter response to the question. A9 #oklad First, I'd get make high five happen and double it. Then I'd eliminate NCLB. 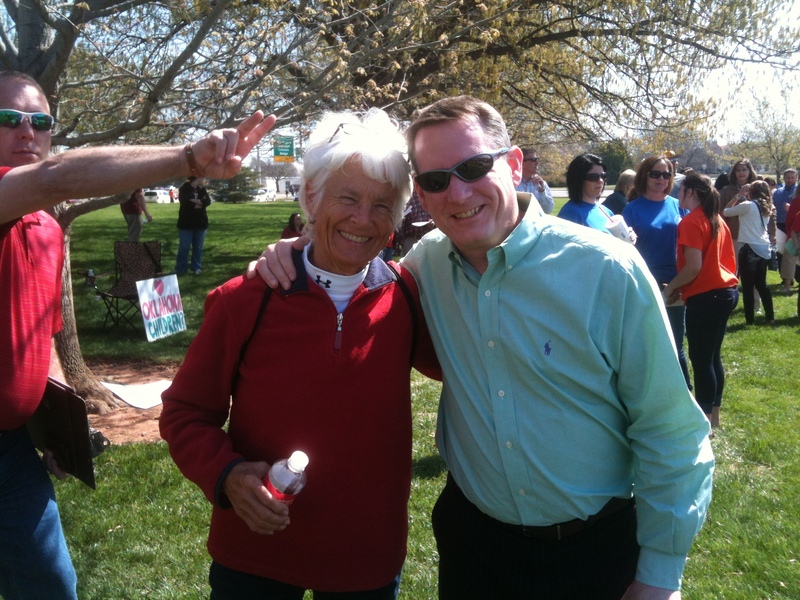 Our current state superintendent has been tireless in her effort to fix some of the broken things at the SDE while continuously advocating for our teachers. 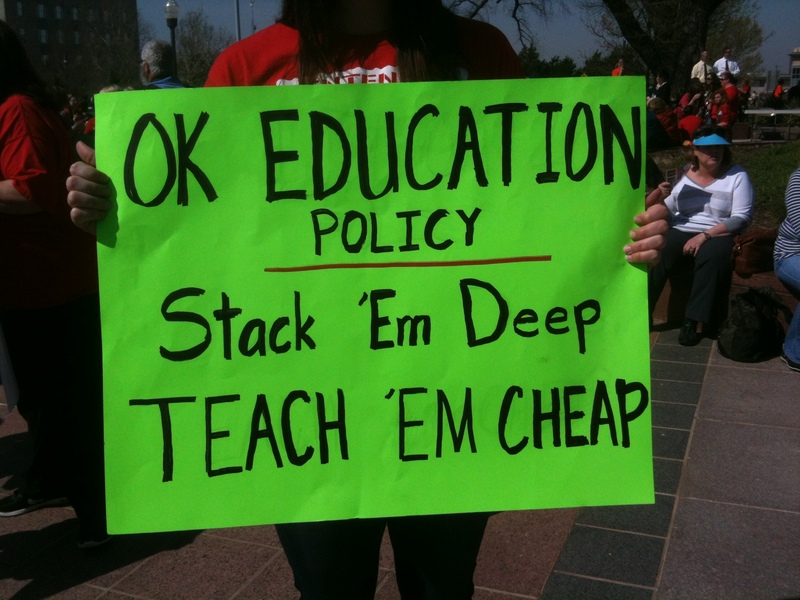 She has proposed a five year plan to raise the average teacher pay in Oklahoma by more than $5,000. I love it – so much that I want to double it. 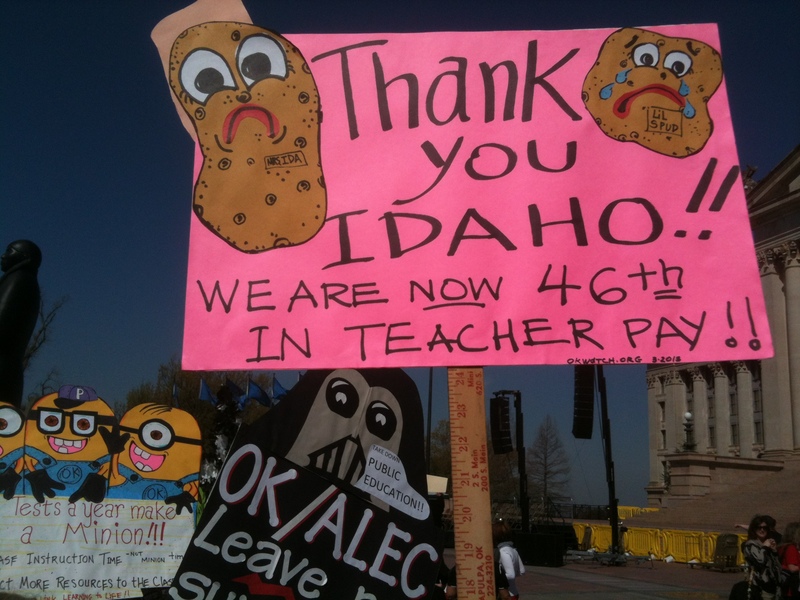 Raising the average teacher pay by the suggested amount would put us ahead of Utah. Raising it by $10,000 would put us ahead of Hawaii – and still below the national average. 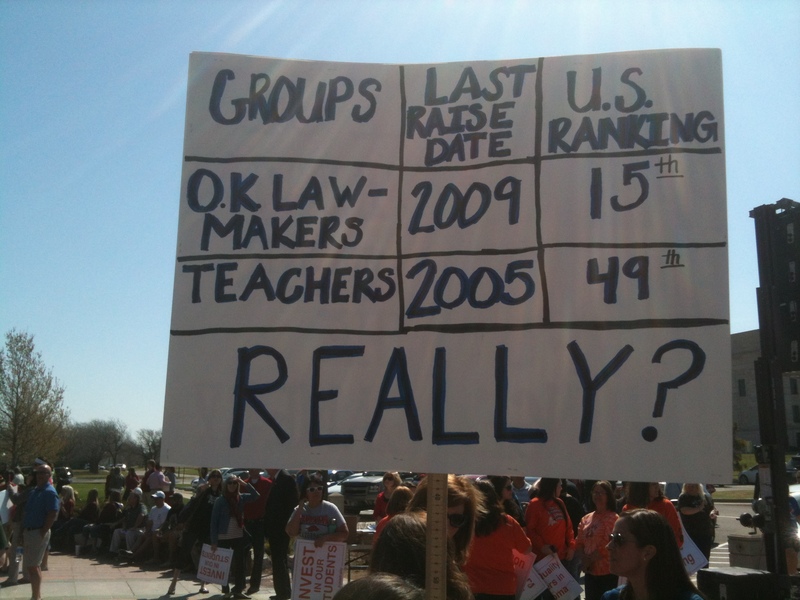 We have to consider that teacher pay is a moving target, except in Oklahoma, where it has been a sitting duck for the last eight years. Since the figures used to compare pay nationally include the cost of health insurance and retirement contributions, we also know that we aren’t likely to see the entire amount in our paychecks. 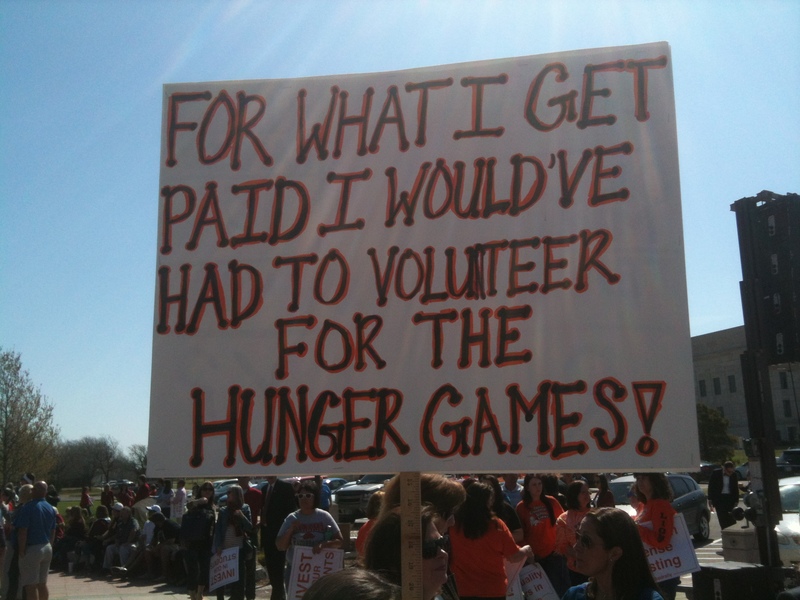 A true 5k salary increase would cost the state much more than 5k. Superintendent Hofmeister understands that we have a huge unmet need in this state. Every kind of school district – big and small, rural, suburban, and urban – has teacher shortages. We have to make the profession more attractive to draw the best candidates. 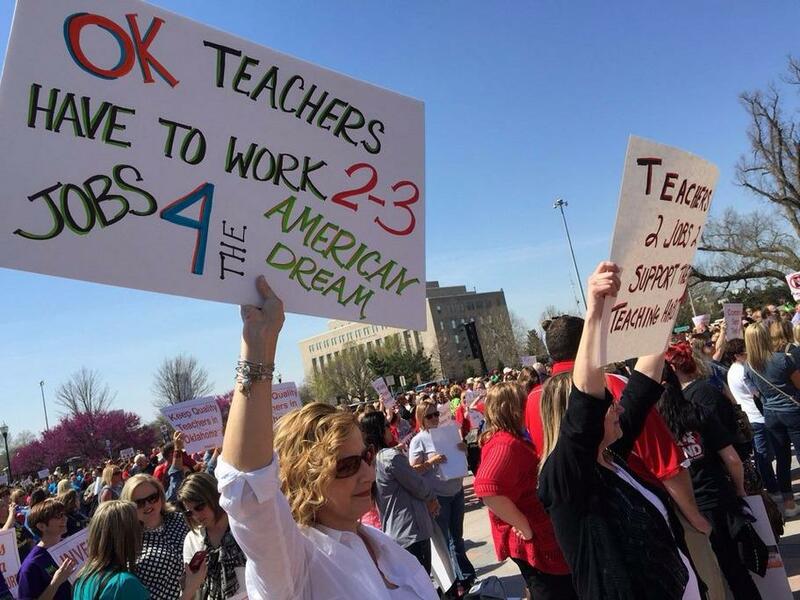 We have to fight to make the good teachers want to stay. It matters to our schools. It matters to our students. 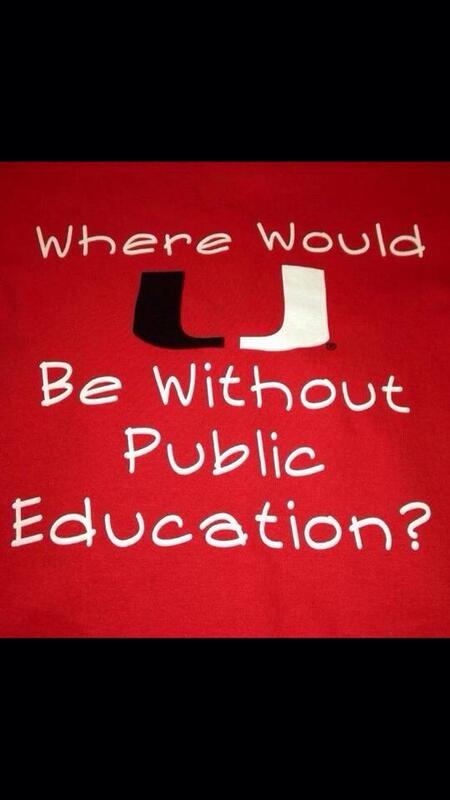 No Child Left Behind needs to go. In 2002, I liked the idea that we would use test data to identify and close achievement gaps. I did not think we would slide down the awful path we’ve taken, however. Some of the email news briefs I used to love reading for their teaching and leadership strategies are nothing but test prep and propaganda now. It’s very disillusioning. 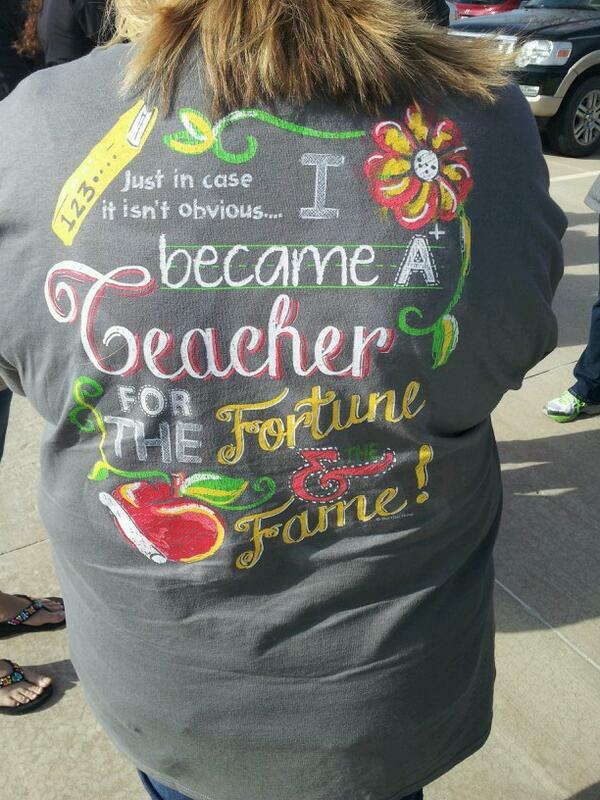 I’ve seen great teachers reduced to a shell of themselves. Even worse, I’ve seen them leave the profession. Our federal waiver is only better in the same way that draining pus provides slight relief from an infected wound. High-stakes testing is a constant shell game. The design ensures that there will be winners and losers. 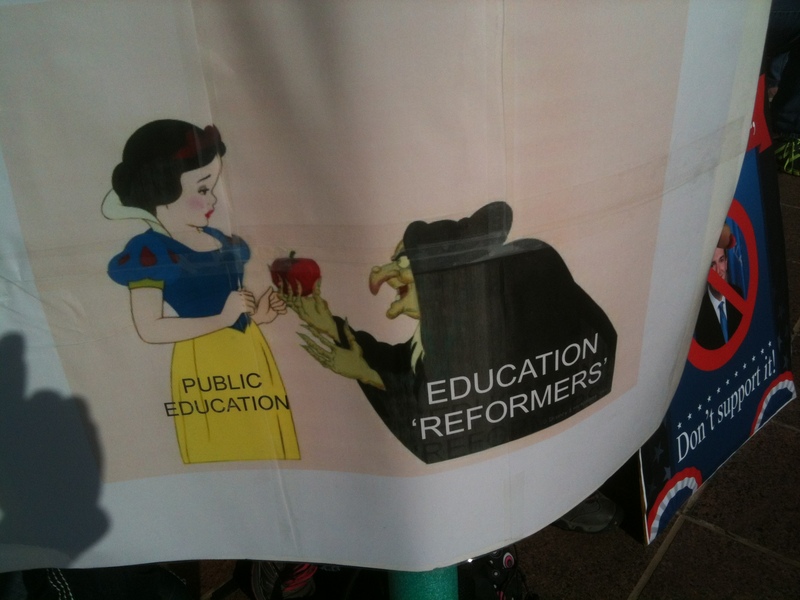 Losers become the targets of corporate education reform. While I’m all for Title I programs and the extra services they provide to schools serving high concentrations of poor students, I don’t like seeing their programs focused on the miserable part of education – testing. Learning should be fun. The closer you are to being on the dreaded list, the less likely it is that school remains so. That’s it, and I kept it brief. Now, when do I start, and how much does it pay? Since I didn’t use my entire allotment, here are a few other entries to the 600 word challenge from my blogeagues (I’m trying something there). Tegan Teaches 5th – Queen for a Day! 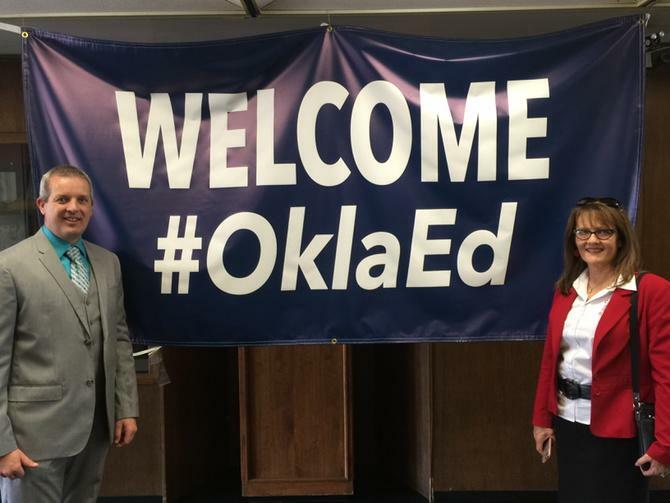 Teaching from Here – If I Am the #Oklaed King for a Day! momof4teacherofmany – Queen for a day…finally!!! I’ll also include Joy’s contribution from last night, though it’s not necessarily a response to the chat question. I hope you’ve all had a good Spring Break. I’ve spent most of it catching up on work, reading, doing a few chores, and sporadically paying attention to education issues. 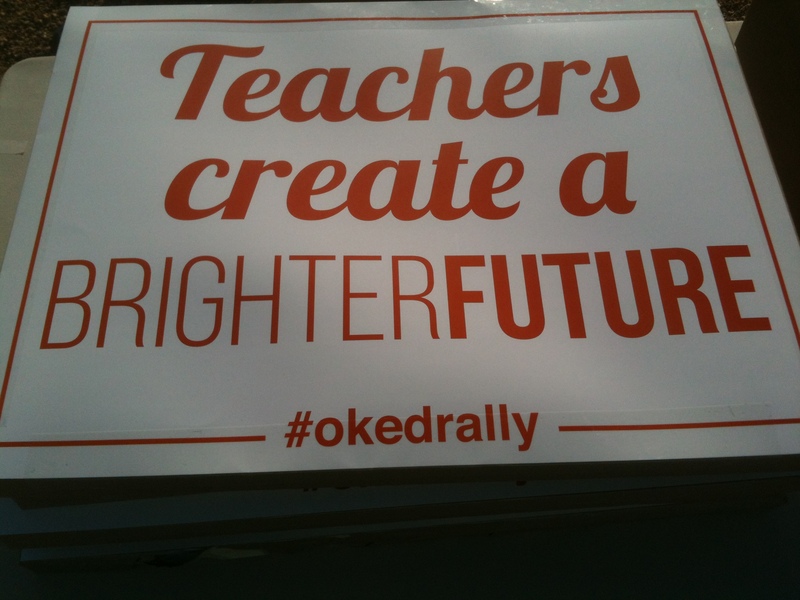 As we get set for the fourth quarter of the school year and the second half of the legislative session, I’ve also been looking for something to tie together the task we in the #oklaed community have ahead of us. In times like these, I often turn to quotes from songs or from movies. With the major league baseball season beginning in about two weeks, I thought about pulling down a Crash Davis monologue from Bull Durham. On the other hand, although I agree with his views on pretty much everything, especially the designated hitter and opening presents Christmas morning, it’s not really an appropriate rant for an education blog. Instead, I’m going to use one of the shortest speeches ever from a Kevin Costner movie. This clip is only six seconds long. The surprise is half the battle. Many things are half the battle, losing is half the battle. Let’s think about what is all the battle. We sometimes fall into the half-the-battle line of thinking in our own conversations. I’ve heard school leaders say that when it comes to effective instruction, relationships are half the battle. Relationships are certainly the most critical element in effective classroom management and instruction, but it is one of at least a dozen elements that contribute to someone being a good teacher. Passion for your content area is critical as well. So is school culture. Collaboration matters too. As does having adequate instructional resources. You get the idea. A similar thought holds true when it comes to our focus on education policy. Most of us can’t carry the flag into battle for or against every piece of legislation that affects public schools in this state, so we focus on the ones that matter the most to us. 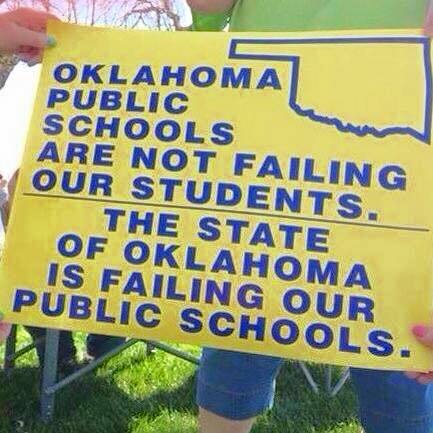 Maybe we think, stopping vouchers would be half the battle, or reducing testing would be half the battle. 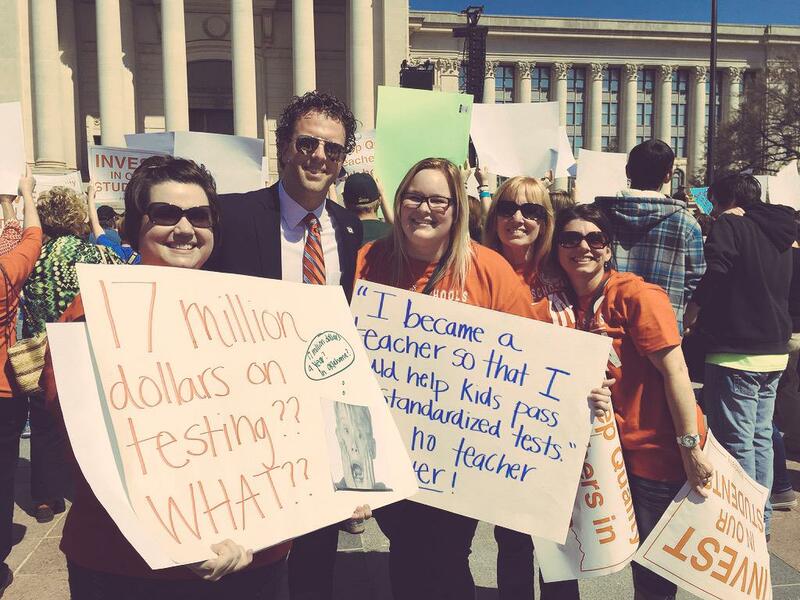 Admittedly, in the limited time I’ve had to write in 2015, I’ve focused on only four things: teacher pay, APUSH, replacing the EOIs with the ACT (SB 707), and Clark Jolley’s voucher extravaganza (SB 609). I’ve tweeted about other issues, but I have to pick my fights. In the process, if I’m lucky, I’m focused on half the battle. 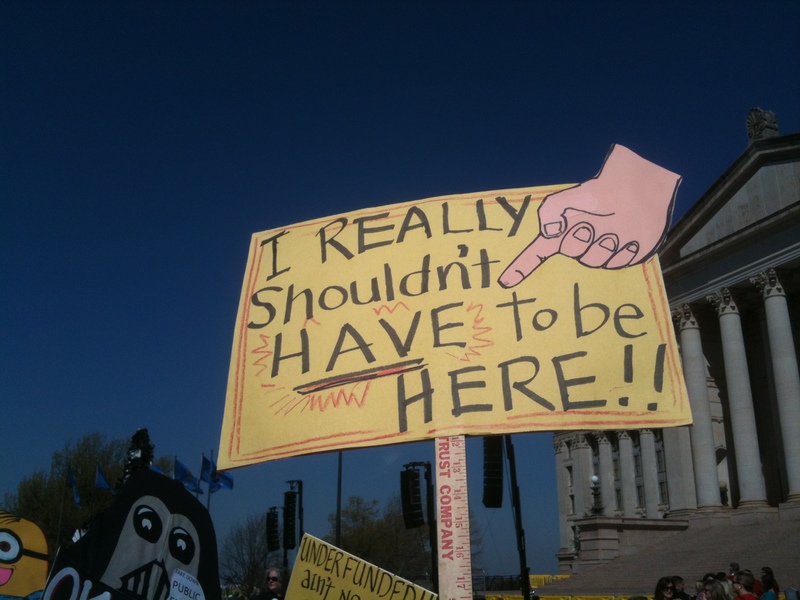 Our friendly Oklahoma Legislature, on the other hand, has time to focus on all the battle. In addition to the above issues, they* also want to restrict how teachers who choose to belong to OEA or AFT have their dues drawn. One legislator explained his vote against this bill saying those supporting it just wanted to poke the union in the eye. 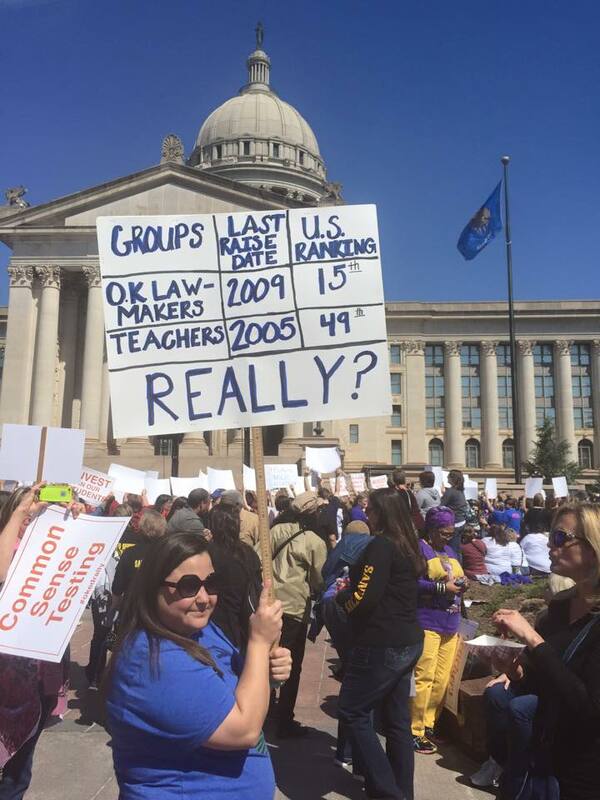 Among those who voted for this bill on the House floor are several legislators who usually earn the praises of the #oklaed community. The reason we must praise the ones who support us in tough times is that we need to have their attention when they do things like this too. 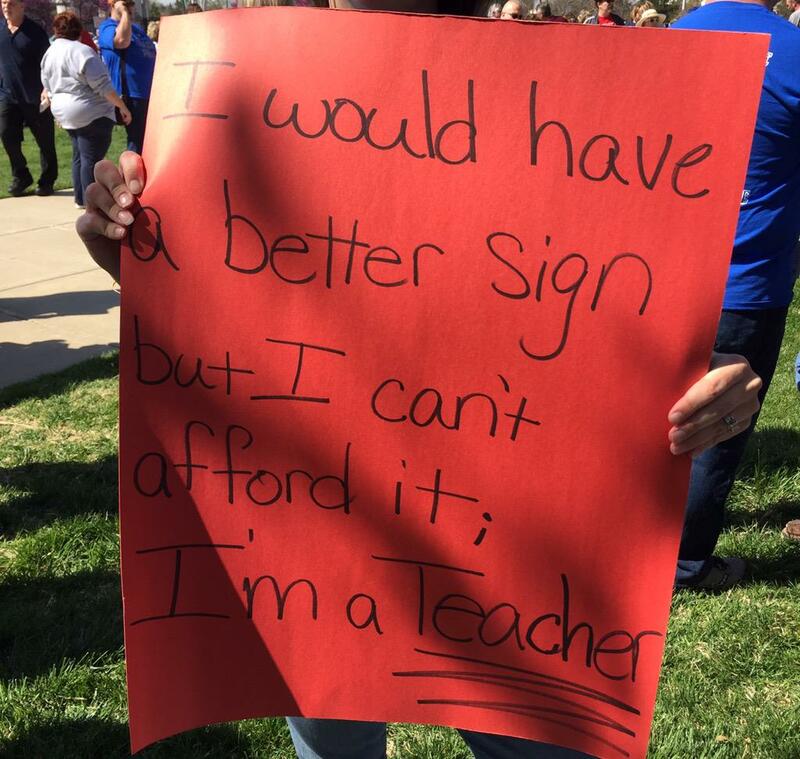 Ultimately, if this passes the Senate and earns the governor’s signature, I imagine the various local bargaining units will still manage to collect dues from teachers. They also want to increase the number of third graders having to prove their worth to a committee to include those scoring Limited Knowledge (rather than just Unsatisfactory) on the third-grade reading test. Never mind that the Speaker Hickman refused to hear Katie Henke’s bill in the House that would have made the promotion committee (including a parent) a permanent part of the RSA process. No, they’re just going with the convoluted senate version instead. It keeps the committee in place for another four years, but it will nearly triple the number of students for whom a committee needs to meet. Again, while any of us focus on the part of the battle we can personally handle, the Legislature continues fighting all of it. As an aside, you may also be wondering, why does it have to be a battle? That is an excellent question. I don’t get it either. 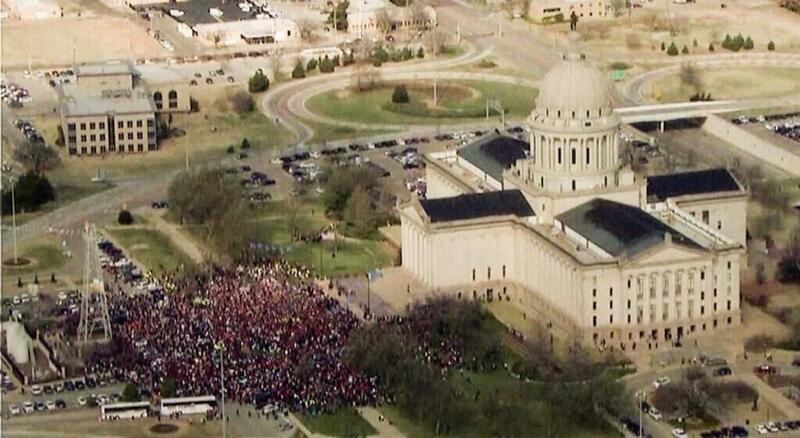 You’d think the people responsible for not providing any funding for teacher raises during the last eight years would at least care enough to support the people who actually work with students. 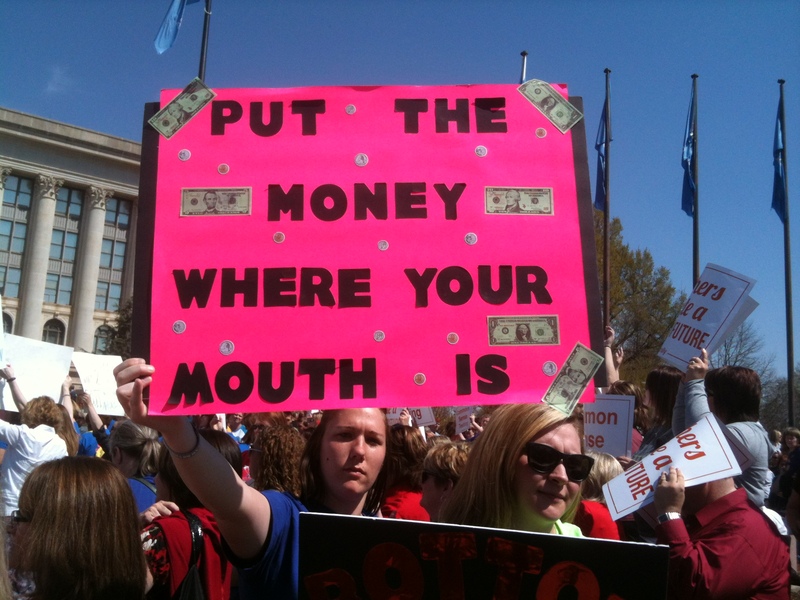 They give lip service to it, but lip service doesn’t solve the teacher shortage. It doesn’t put food on the table. 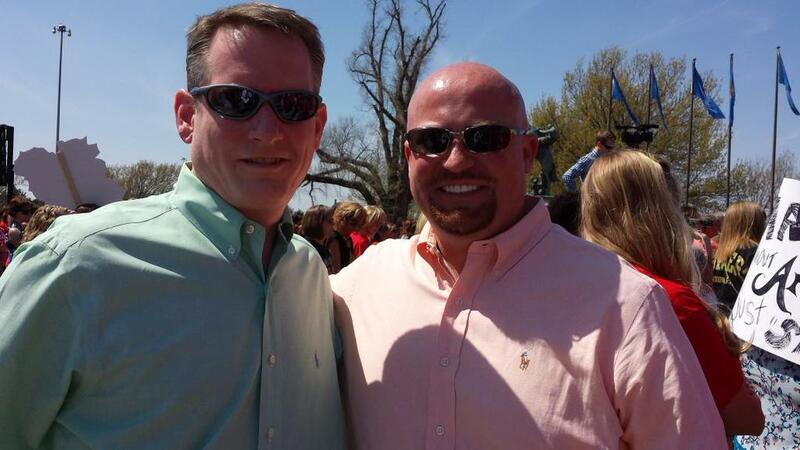 It doesn’t show that our elected leaders respect teachers. Meanwhile, the policy attacks continue. Last year, the voucher battle wasn’t even close. This year it was. 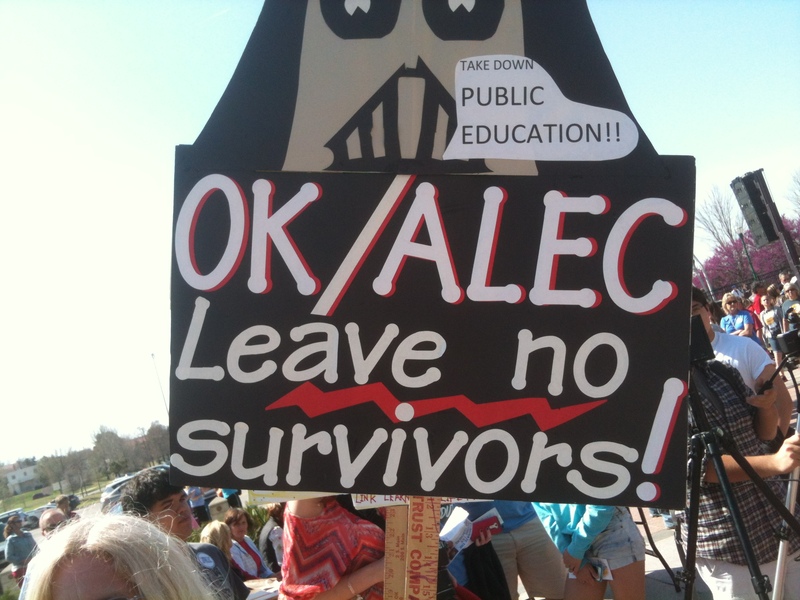 While we focused our blogs and phone calls tirelessly on that, legislators ran other bills to chip away at the remaining strengths of public education – all while saying they have a $611 million hole and no way to fill it. 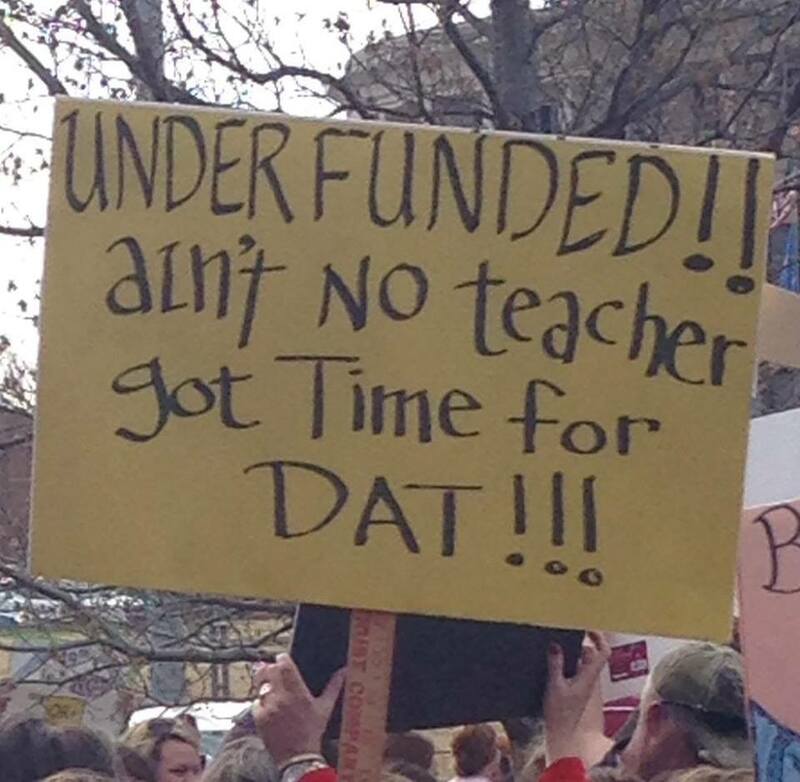 Yes, it’s promising that we have a state superintendent who is willing to sound the alarm and let the world know that the teacher shortage will only widen if we don’t get more funding. We also have a governor who hasn’t said a word. The battle is not unique to Oklahoma. Nor does it just impact the teachers. 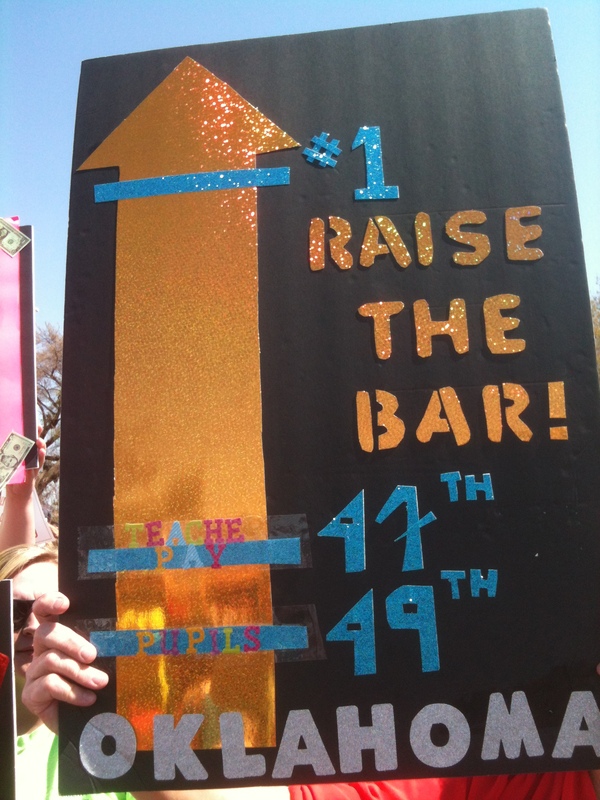 Parents who speak out against corporate reform and high-stakes testing also face marginalization. Meanwhile, even within his own party, Jeb Bush is no longer seen as the expert on education. Florida is fighting back, as are the states that have adopted Florida’s model. 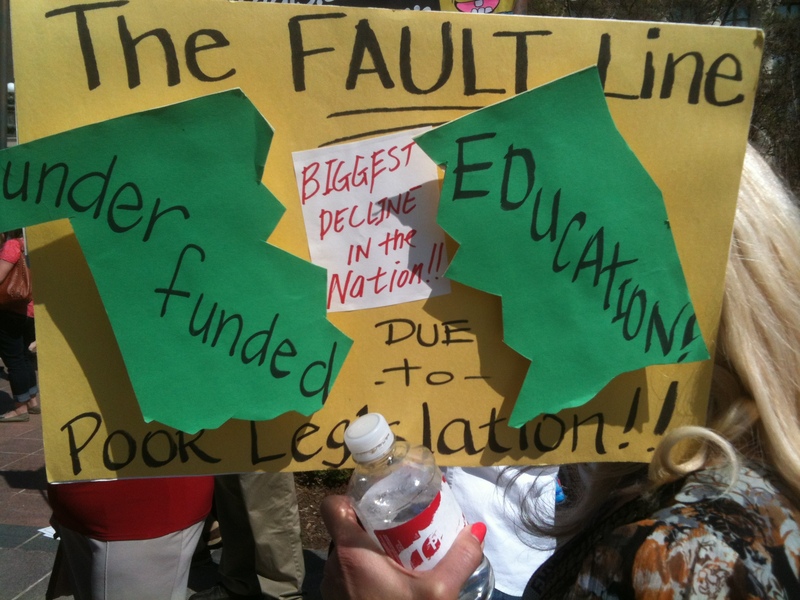 We had our own little revolt against this anti-education machine last June. It went well. Since then, we haven’t exactly been complacent. The attacks just keep coming. 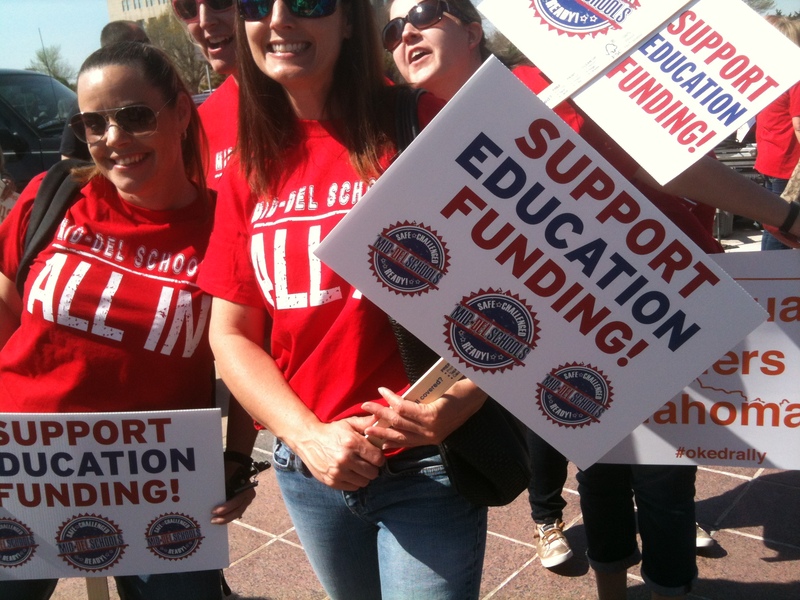 Parents and educators uniting to fight back must be half the battle, right? It’s a start. All the battle is about money and respect. Simply put, that’s all we’ll be asking for on March 30th. *When I say they, obviously I don’t mean all. 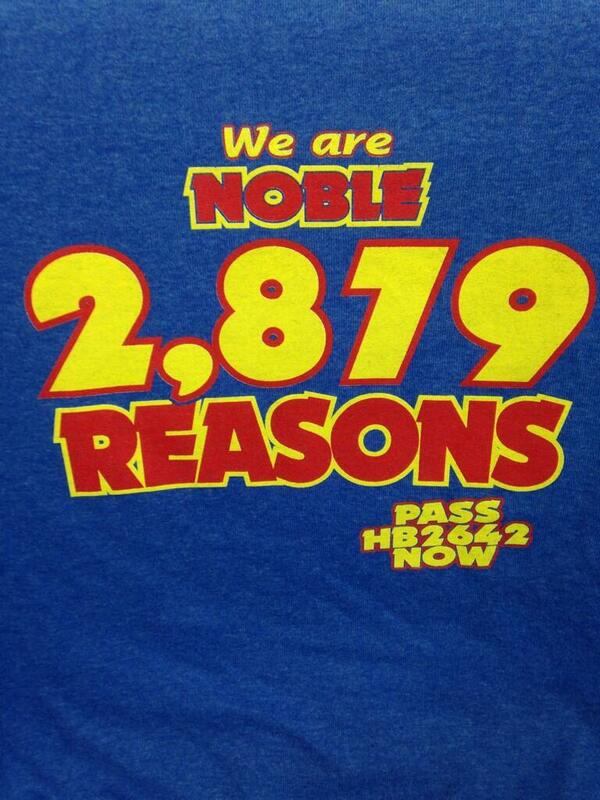 Since support varies from bill to bill, though, it’s hard so give any legislator a pass at this point. So far, I’ve written about ten reasons why we should dump the EOIs and use the ACT as our high school test. 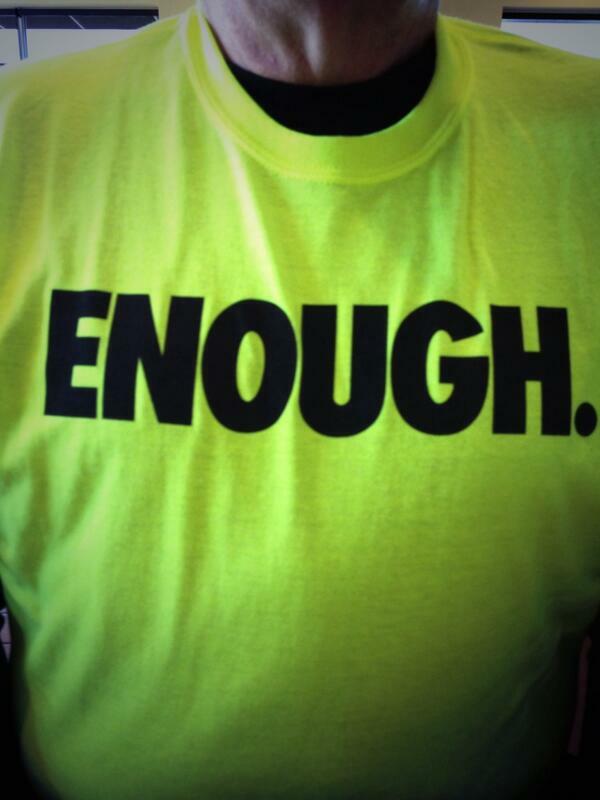 You want the ubiquitous College and Career Readiness? It’s there; both higher education and career tech can make use of the results. You want to preserve instructional time in schools, save parents and the state money, and improve critical relationships? We can do that too. Still, I keep getting questions, and the answers aren’t all easy. You see, punting the EOIs and running with the ACT is not a perfect choice. No such thing exists. …and Part II of the series. Counselors would have more time to be counselors. Teachers would have more time to be teachers. The ACT unites K-12, Higher Ed, and Career Tech. Feedback will be timely . 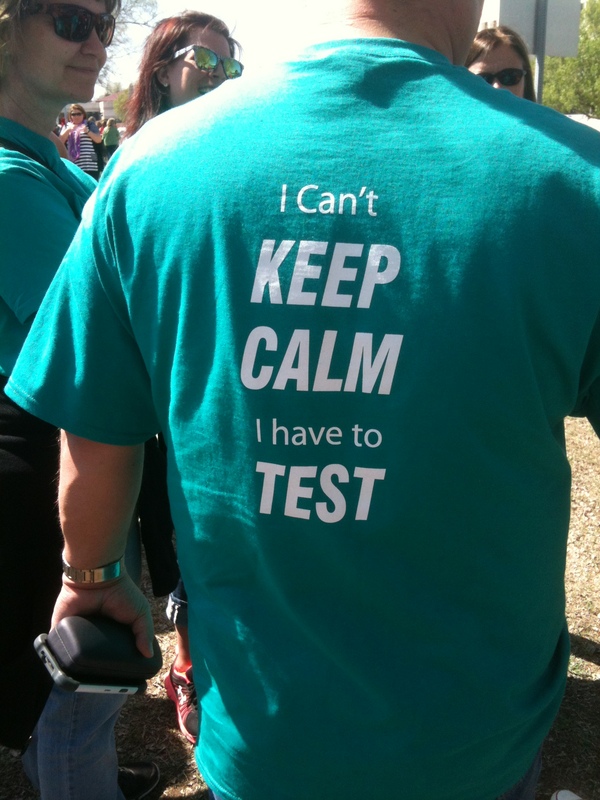 Schools can quit begging for volunteers during testing season. ACT is Common Core – This is false. ACT is a test that is aligned both to its own college readiness standards and the Common Core. The truth is that a single test question can be aligned to multiple standards. ACT has always paid attention to state standards. 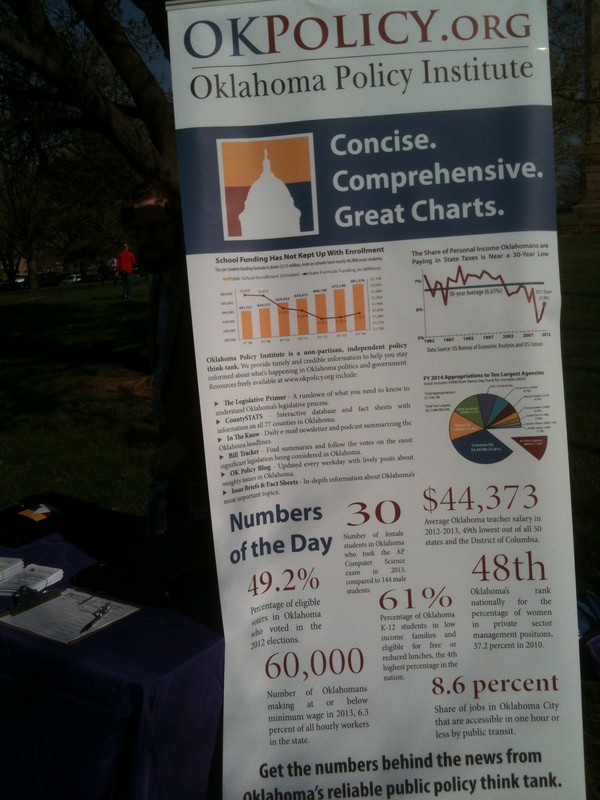 Half the country is still using the Common Core, and ACT is responsive to the marketplace. I have no problem with this. ACT is too closely aligned with Pearson – At this point, who isn’t? 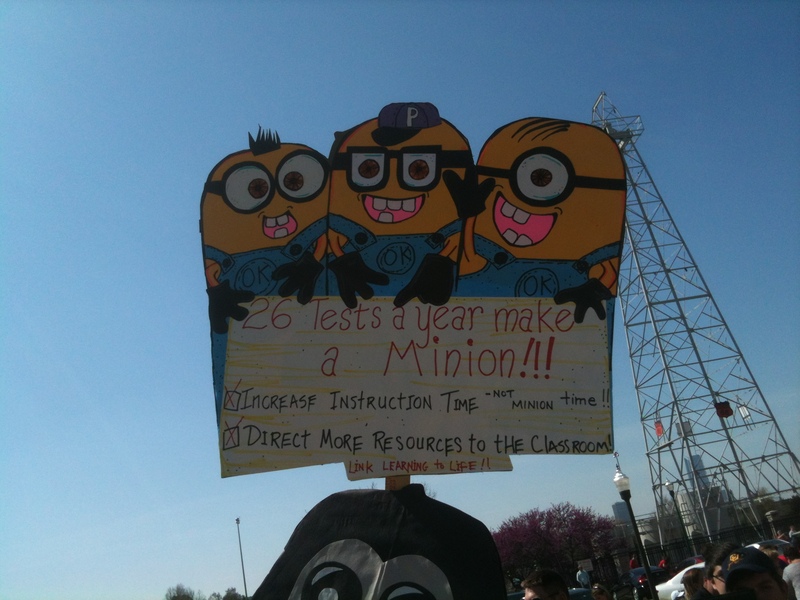 It’s true that Pearson makes a ton of profit from testing. They also make a ton of profit from textbooks, online instruction, educational software, and probably the air we breathe. Yes, ACT is running their Aspire assessment program (3rd through 8th grade) off of a platform developed by Pearson. 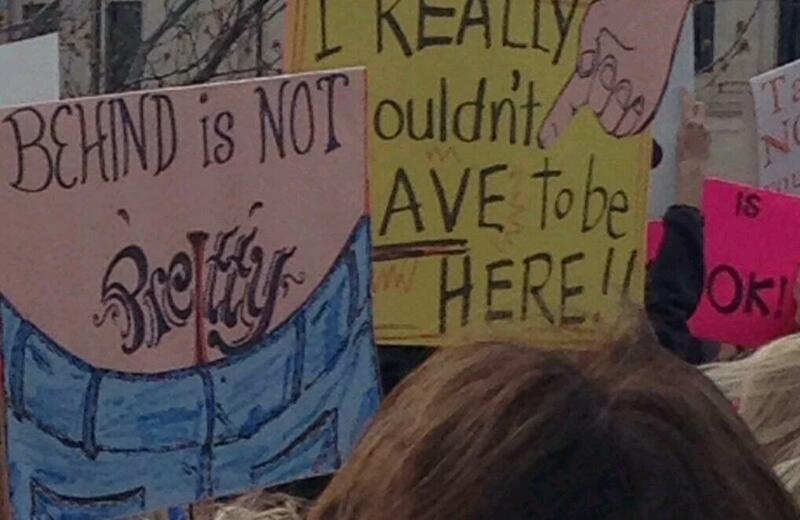 Paying for every student in the state to take an ACT wouldn’t really be padding Pearson’s pockets anyway. Tests on the national test date are still paper/pencil tests. Most Oklahoma high school students will take the ACT at least once anyway. 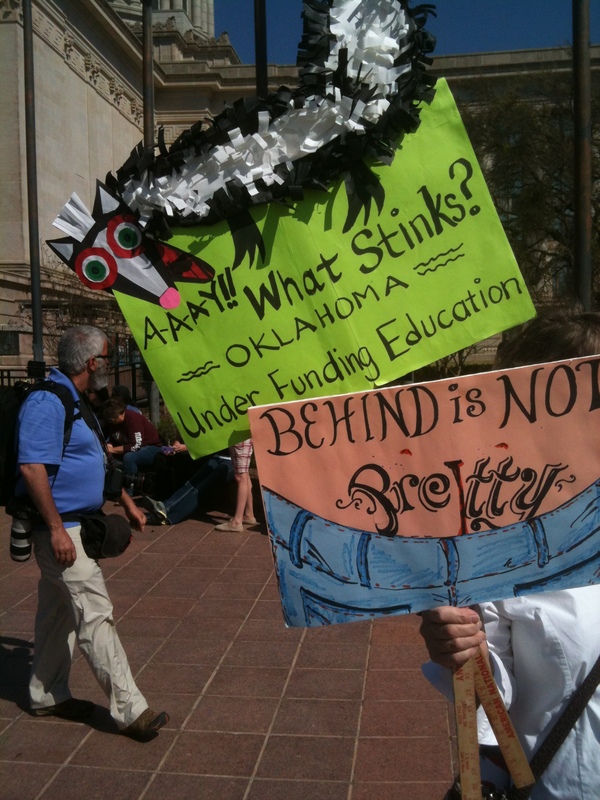 We’re not going to make Pearson go broke by boycotting the ACT – no more than we’re going to make the Oklahoman go broke by – oh wait, too close to call on that one! As much as I want the Gates Foundation out of education policy, I’m also not going to make Microsoft go broke by switching from a Windows computer to a Mac – just my school district. Some kids aren’t going to college – This is also true. The problem is that I can’t look at them and know which ones. Sometimes, I can’t even talk to them and know. They don’t always know themselves. I propose giving all students an ACT during their sophomore year (some are suggesting the junior year) because it would give parents and counselors something to look at in terms of course selection. It also might ignite the interest of a student who didn’t know he/she would score so well. Taking the ACT doesn’t obligate a student to go to college. It just puts a number on the table that may help people make some decisions about the future before the future is right in their faces. 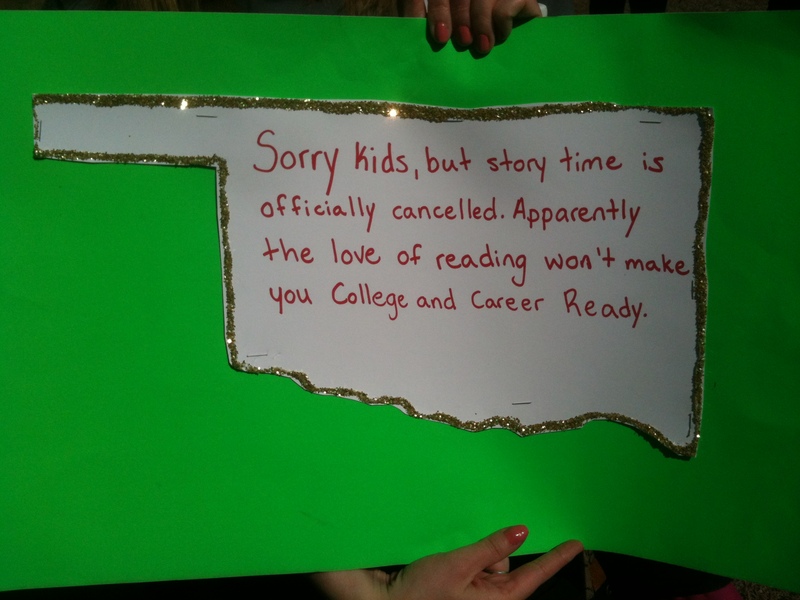 The ACT doesn’t have science and social studies sections – Again, this is true. I know some of the people who loved me when I was fighting for APUSH a few weeks ago will despise me saying this, but I really don’t care if we test in those subject areas. I think the teachers benefit from not having their subject area tested. It gives them a better chance to focus on the students and the standards – all the standards. It goes back to my first two points above. If the students don’t care about the results and the colleges don’t care about the results, then what are we testing for? The science reasoning of the ACT doesn’t align well enough to course content to meet NCLB requirements – This may be the most valid of the five points. 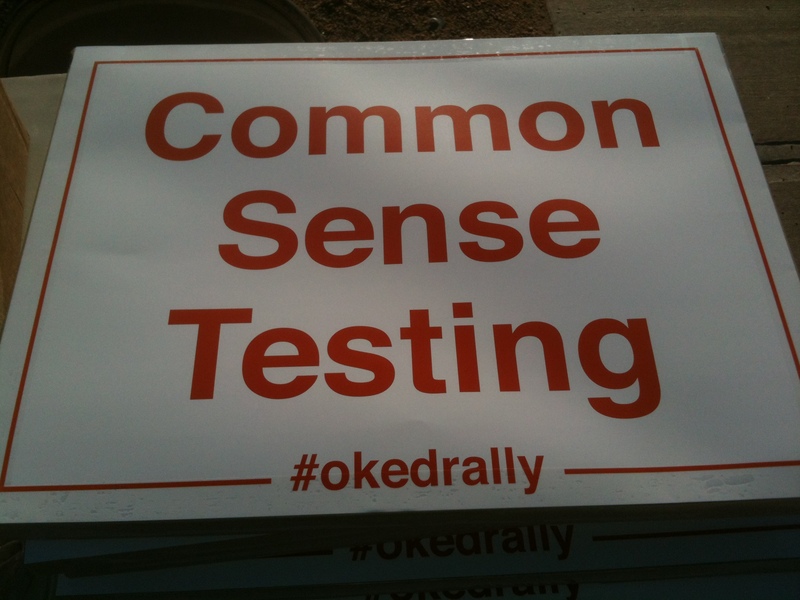 Federal statutes say nothing about testing social studies. The way I see it, Oklahoma would have two options to meet this requirement if we replaced the EOIs with the ACT: (a) Explore the extent to which ACT’s standards align to Oklahoma Academic Standards for Science and submit this analysis to the feds with our updated waiver request; or (b) develop a separate science test (basically, keep using the Biology I assessment we have in place now). This could be a road bump, but it is far from a dead end. Ultimately, I don’t know how much a Biology test that most students have to take in ninth or tenth grade says about their readiness for high school graduation or college entrance. This is one of the massive problems with No Child Left Behind and the main reason we should be working together as a state to minimize the damage it brings to our students and schools. 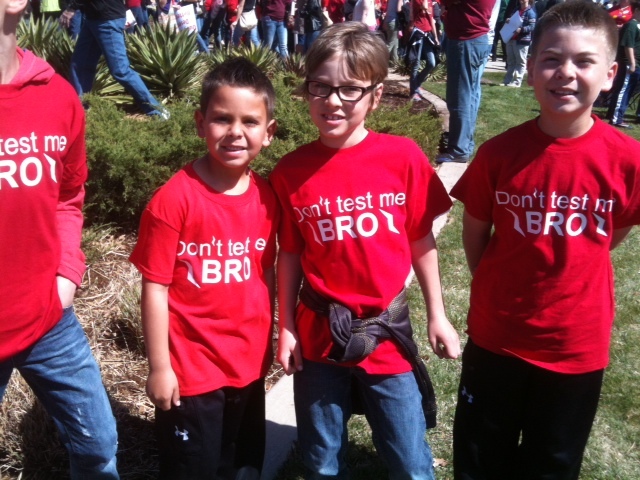 With the last several posts on this blog (save one calling for a no vote on a voucher bill), I have been trying to make a case, more or less for supporting SB 707. Nowhere does the bill specify that ACT will be our high school testing vendor. Most people I talk to read it that way. Still, the process would include multiple state agencies and public hearings – real ones this time. Recommendations would be made in 2016, and implementation would begin during the 2017-18 school year. This is not a rush job. It’s also not a rock to which we are chaining ourselves. Should the vendor fail to meet our expectations, we can fire them. The legislation can change the law at any time. That’s why I support this bill – and pretty much by default, replacing the EOIs with the ACT. It passed through the Senate Committee on Education by a vote of 11-1. It passed through the Committee on Appropriations by a vote of 37-6 (yes, nearly the full Senate serves on that committee). It sounds like a done deal, at least in the Legislature’s upper chamber, right? Keep calling. You can never tell.